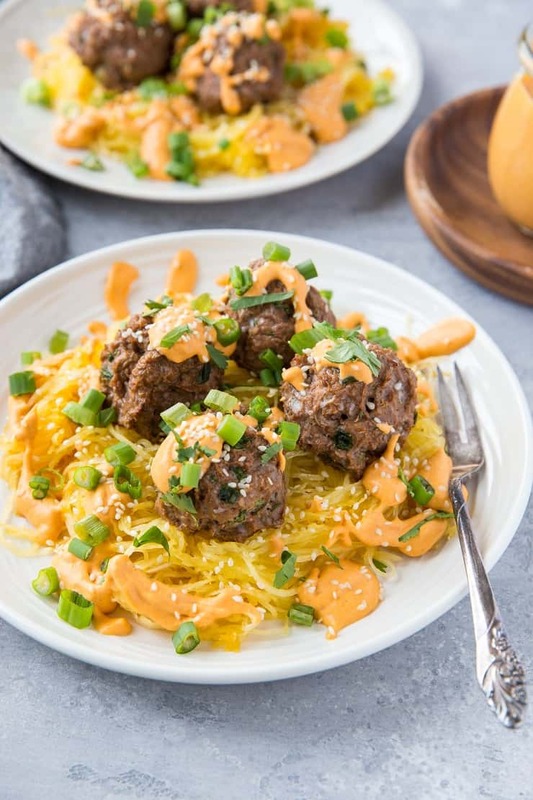 Thai-style red curry meatballs with an easy red curry sauce and spaghetti squash make for a clean and hearty dinner! Make it ahead of time and enjoy throughout the week! 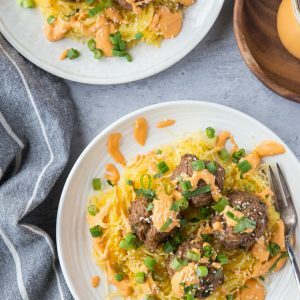 Did you check out the Thai Meatballs from the Keto Quick Start Cookbook I posted a few weeks ago? I thought I’d re-visit the topic, because, you guys, these meatballs are SO GOOD! Let’s make a thing of them, shall we? All we’re doing here is baking up a batch of the Thai Meatballs, whipping up a red curry sauce, and roasting a butternut squash. Three components, minimal effort, ALL THE FLAVOR! Put everything in a big bowl, mix it all around, and enjoy this hearty, nutritious meal! Lettuce discuss this red curry sauce situation. 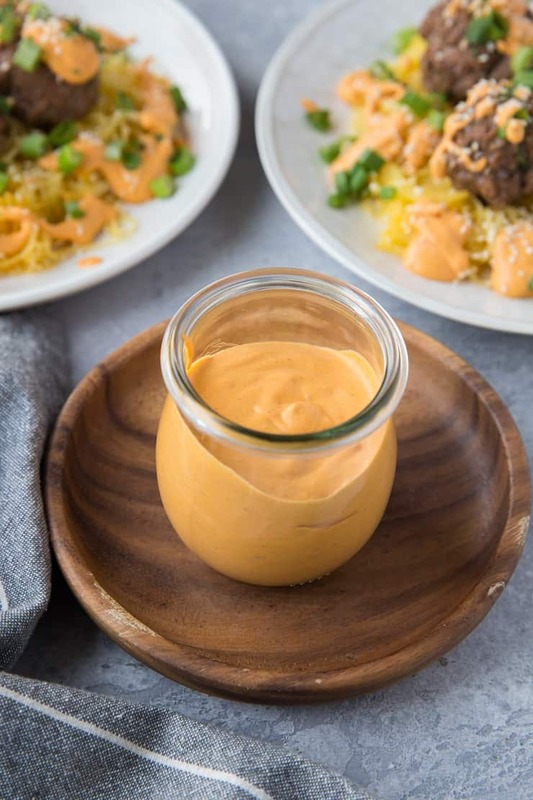 All you need is full-fat canned coconut milk, red curry paste (yes, this is store-bought, yup, we’re going for easy peasy here! ), fresh ginger, and a touch of fish sauce. Simply heat it all up on the stove top and use it for all your red curry needs. Which brings me to my next point: this red curry sauce is versatile AF! Use it to your heart’s delight to add Thai flair to any of your meals. Use green curry paste for the sauce instead of red to change up the Thai flavor. 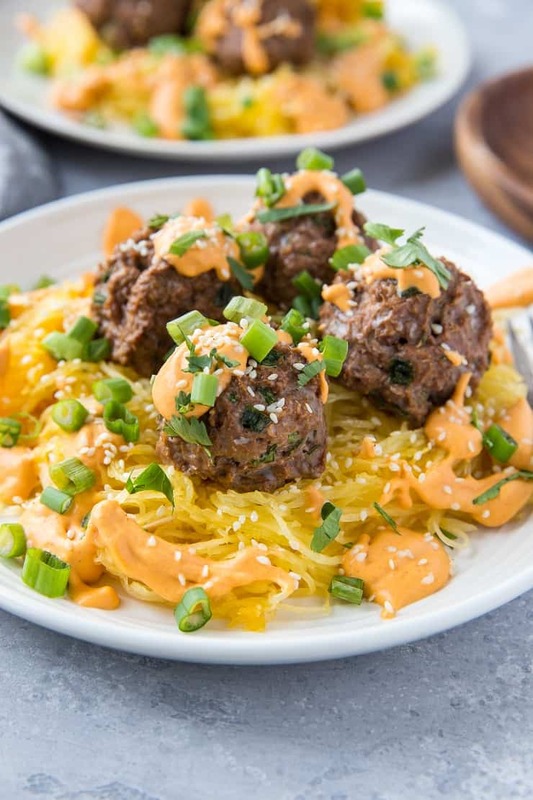 Swap the ground beef in the meatballs for any of your favorite ground meats. The spaghetti squash can be roasted up to 5 days ahead of time. Prepare the red curry sauce up to 1 week ahead of time. Bake the meatballs and freeze until ready to use. Heat all ingredients for the red curry sauce in a saucepan over medium heat. Bring to a gentle, yet controlled boil. Cook, stirring occasionally, 15 minutes. Remove from heat and set aside until ready to use. Note: the sauce will become even more flavorful as it sits - you can prepare the sauce up to 1 week ahead of time and re-heat when necessary. Prepare the Thai Meatballs according to instructions, and roast the spaghetti squash (if you are new to roasting spaghetti squash, use these instructions). 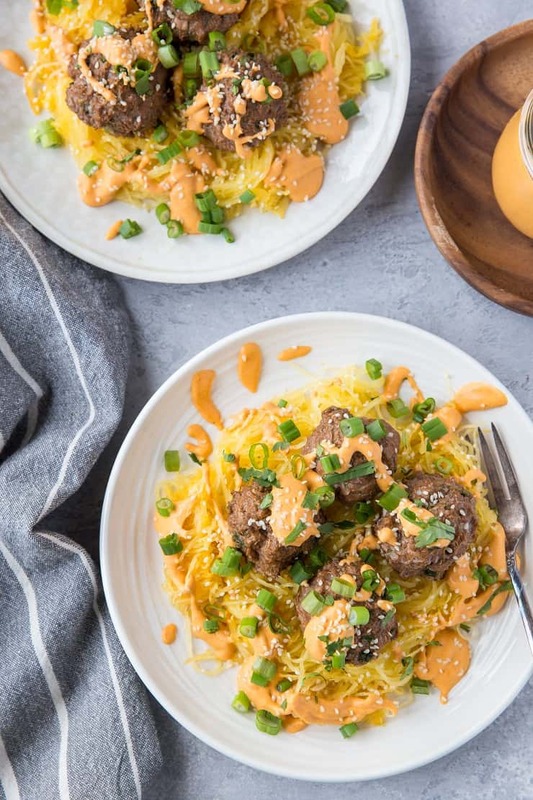 Serve meatballs over spaghetti squash with red curry sauce. If desired, serve with green onion, cilantro, and sesame seeds. what are the amounts of each ingredient for the curry sauce? Your recipe lacks information. I don’t see the recipe for the red curry sauce either. Would love to make this, yet can’t as the full list of ingredients is not included in the post. Will make when I have all the makins’ For the curry sauce. is the instructions for the red curry sauce?